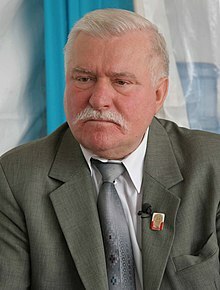 Lech Wałęsa (born 29 September 1943) is a Polish politician, trade union organizer, philanthropist and human rights activist, who became the first democratically elected President of Poland (1990–1995) after the fall of the People's Republic of Poland. He is well known for his unintendedly humorous quotes. I'd sign anything then, except consent for the betrayal of God and Fatherland. Being accused of being an agent for the Soviet era communist police, quoted on New Europe (February 18, 2016), "Poland’s former president accused of being a communist spy"
Na zmęczeniu, goryczy, uczuciu bezsilności nie można budować. I am convinced that Germany has drawn conclusions [from World War II] and Europe has drawn conclusions as well. And I can say an unpopular thing. If once again Germany should risk destabilizing Europe, then there would be no division of Germany — it would simply be blown off the map of Europe. With the kind of technology that exists, with the kind of experiences we have had, there can be no other way — and the Germans know it. It is good that it came out that bad. Positive pluses and negative pluses. I turned around by 360 degrees. I am for, and even against.